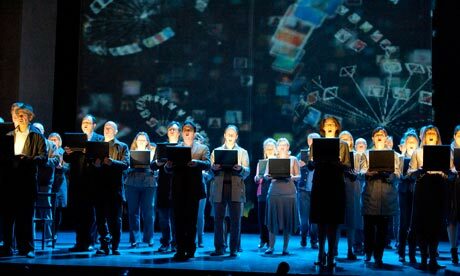 The internet brought to operatic life in “Two Boys” by Nico Muhly, at the London Coliseum. Before the year 2000 came around, 20th century composition was about as recent as one could get; seeing as, well, the 21st century had not arrived yet. Compositions in the latter half of the 20th century breached structures less common, keys less recognizable, use of shorthand that never existed…all kinds of conventions that weren’t as expected in a typical college-level theory class. These strategies and motifs were how music extended itself to new borders and reinvented itself to take on new tonal personality. At this point though, we’re in the 21st century. Every ten years’ time seems to be designated its own audio flavor and pop culture scandal, even when we as a speaking public can’t necessarily come up with a snappy nickname for said short era. (00s?) The sounds and stylings of the 20th century are now in the past and what are we doing as a classical community to give the 21st century its own compositional identity? While I don’t have a complete answer to this query, I do have a set of examples that I think demonstrate a sense of evolution that could be considered a new facet of 21st century compositional thinking. Recently, (meaning the past couple of months,) I have come into contact with two different pieces that stood out and caught my attention. One by the famed contemporary classical composer Nico Muhly and one by the new Pulitzer Prize winning violinist (and composer,) Caroline Shaw. The reason for pointing out this particular reaction and its connection to Nico Muhly and Two Boys, comes from the unique ways these very different people seemed to have stumbled upon composing the same idea: Sounds of the internet. Two Boys, as you will hear elaborated upon within the video below, deals with a story that revolves almost entirely around characters interacting over the early version of the web and chat rooms. While that subject matter is fascinating all on its own, the way in which Muhly personifies the mostly silent venture of “talking” over the internet so that it stands as sufficient to support an entire opera, is what fascinates on an entirely different and higher level. Aside from the occasional “beeps” and ringing sounds heard in early messaging programs or chat rooms, there was no actual speaking to be heard, let alone any kind of singing worth stage wide praise. Indeed, during the minimal amount disclosed in the Met’s video, one does hear an aggregate of voices, clashing together and yet staying in a musically tolerable form and not descending into complete aural chaos, even if that’s how early chat room screens might have tended to appear visually –as anyone who has ever tried to carry on a linear conversation in one of these virtual hangouts knows. Melodically and harmonically speaking, it doesn’t come across as the most pleasant blend, though it does seem to fit together in a technical sense. “Partita” on the other hand, is not a piece revolving around the internet but nevertheless delivers a similar aural aesthetic, in between the same eight people singing these very pristine and simple chords. This video contains the debut performance of movement four, “Passacaglia,” by Roomful of Teeth, a vocal group that Shaw has long been involved with and to whom her Pulitzer-winning piece is dedicated, as it was written with and for them. The spoken parts within Passacaglia involve inspiration from the text of Sol LeWitt’s “Wall Drawing 305” displayed at MASS MoCA. The eventual rise of “cacophony,” as NPR likes to call it, is created by overlapping and increasingly colliding voices speaking the same lines at different times –much like a round gone somewhat awry. Though Shaw was not setting out to emulate the internet as Muhly was, her “version” embodies much more of what a person might be inclined to imagine if the internet were made to be aloud. (After all, I don’t believe people chat rooms always harmonize, even in early Pentecostal form.) Still, the intrigue keeps coming before everything is over because, Shaw is saying both that she “really want[ed] to hear the sound of jumbled talking, where you can’t understand what’s going on” but also that “[it’s] orchestrated jumbled talking.” In that regard, there is likely to be a lot more focus on rhythmic synchronization hidden among the jumble because the lines are not melodic. However, rhythmic stability is still very much a traditional element of music. Going back for a moment to 20th century music, a common quality in some works saw that it also utilized “noises” and non-typical sounds in compositions. Things like bangs and crashes and typewriters and non-musical glass…John Cage and Phillip Glass are two prominent examples of 20th century composers with such kinds of ideas. Conversely, Muhly and Shaw are creating what they think of in their heads as these “atypical sounds,” using music’s traditional melodic and rhythmic structures and rules. It just so happens that the internet is the vehicle of choice for both these artists, which makes for a playful coincidence. The bigger question arising from their interpretations of this (coincidentally) non-audible space, is whether or not this kind of “reverse personification of sound” in music might become either one of several, or the single signature strategy of modern 21st century classical music: Taking music (or elements thereof) and putting them in a role that is not inherently musical, as opposed to taking inherently non-musical elements and putting them in the throes of traditional melody and harmony. Pop music: A “dumber” style than classical?